Human-robot collaboration (HRC) describes a work scenario in which humans and automated machines share the same workspace and work within it simultaneously. Driven by Industry 4.0, this model promises the interaction of highly flexible work processes, maximum plant availability and productivity, as well as economic efficiency. But HRC will only be able to live up to this promise when appropriate application-specific safety technology is assured. Industrial automation focused on interaction between humans and machines long before the initiation of Industry 4.0. Until now, two interaction scenarios – coexistence and cooperation – have dominated, representing about 90 percent of such situations. Space and time are the important interaction parameters here. Coexistence describes a work situation in which the human and the machine are in neighbouring areas at the same time during the interaction. Cooperation, on the other hand, is an interaction during which the human and the machine share the same work area but work within it at different times. A third form of interaction is increasingly being focused on within the framework of Industry 4.0: collaboration between the human and the robot during which they share the same workspace at the same time. In such collaborative scenarios, the standard industrial robot with safe kinematics is no longer sufficiently safe, so collaborative robots must be used. In this case the forces, speeds and travel paths of the robot must be monitored, and limited, depending on the actual degree of risk. If necessary, the robot is stopped or switched off. 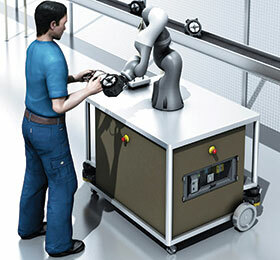 The distance between the human and the robot thus becomes a decisive safety-relevant parameter. Since no two human-robot collaborations are the same, an individual risk assessment of the HRC is necessary even if the robot used has been specially developed for this collaboration with humans. Such a ‘coboter’ will already have several of the features of an inherently safe design right from the initial considerations. At the same time, however, the collaboration space must also meet fundamental requirements, e.g. regarding minimum distances to neighbouring accessible areas that present crushing or trapping risks. The standards basis for the functional safety of HRC applications consists of general standards, such as IEC 61508, IEC 62061 and ISO 13849-1/-2. In addition, ISO 10218-1/-2 on the safety of industrial robots and, especially, ISO/TS 15066 on robots for collaborative operation, must be taken into account. Developers and integrators of robot systems must not only carefully examine the functionalities and compliance with standards of the design-related protective measures undertaken by the robot’s producer, but also take into account any residual hazards and risks. It is therefore necessary to carry out a risk assessment on the robot system according to ISO 12100 in order to derive appropriate safety measures for risk reduction, e.g. safety light curtains or safety laser scanners. According to the technical specification ISO/TS 15066, there are four different types of collaborative operation. The ‘safety-rated monitored stop’ halts the robot for interaction with the human; ‘hand guiding’ ensures safe HRC because the robot is deliberately guided manually at an appropriately reduced speed. In the third type of collaboration, ‘power and force limiting’, the necessary safety is achieved by reducing the power, force and speed of the robot, e.g. by using limiting functions for safety-relevant control systems, or an inherently safe design of the robot with a biomechanical load limit at which no hazard or injuries are to be expected. This takes place regardless of whether there is any intentional or unintentional physical contact between the robot and a human. The fourth type of collaboration, ‘speed and separation monitoring’, is very much in the spirit of highly flexible work scenarios. It is based on monitoring of the speed and travel paths of the robot and adapted to the work speed of the operator in the protected collaboration space. Safety distances are permanently monitored and, when necessary, the robot is slowed down or stopped, or its travel path is changed. The robot system can automatically resume its movements, with the usual speeds and travel paths, when the distance between the operator and the machine increases again to greater than the permitted minimum distance. This restores the robot’s productivity without delay. Of the four different types of collaboration quoted in ISO/TS 15066, it is ‘speed and separation monitoring’ that offers the greatest future potential in HRC applications. Therefore, whilst not neglecting the still-dominant interaction scenarios of coexistence and cooperation, it is clear that safety-oriented sensor and control technology faces new challenges in enabling unhindered human-robot collaboration.